Cinco de Mayo has become one of the funnest days in the spring. Colors and flavors abound in this celebration of Mexican culture. Instead of reaching for the quick nachos and beer, though, why not use this holiday to enjoy something really delicious? My friends at Azuñia Tequila have challenged me to create a more sophisticated dish for Cinco de Mayo. I have to say that these VEGAN STREET TACOS are possibly my favorite dish that I've made in a long time. I could eat them every day. Pair them with one of Azuñia Tequila's upscale cocktails, like the Strawberry Fields Forever, and you will have one heck of a party! This recipe was created as part of Azuñia Tequila's Cinco de Mayo Recipe Contest. If you'd like to vote for this gluten-free, food allergy friendly, vegan recipe (and isn't it nice when something everyone can eat wins? ), check out their contest page. In a food processor , finely mince garlic, chipotles plus extra adobo sauce, and onion. Heat 1 tablespoon olive oil in a stock pot or large sauce pan. Add vinegar and half the water, let simmer uncovered for 7 minutes. Add remaining water, stir and simmer for another 8 minutes. While onion sauce is cooking, shred scrubbed sweet potatoes with their skin in a food processor or with a box grater. Heat remaining tablespoon olive oil in a large skillet or saute pan over medium high heat. Add sweet potatoes. Cook for five minutes without stirring. After five minutes, stir sweet potatoes and continue cooking until tender with crispy bits, approximately 10 more minutes. Remove bay leaf from onion mixture and stir in lime juice. Add sweet potatoes, and stir thoroughly. Let flavors meld for at least five minutes over medium heat. Heat corn tortillas in a dry skillet. Top with onions and cilantro. This is a sponsored post. Azuñia Tequila paid me to create the recipe. All opinions are my own. I love sweet potatoes so much and these look and sound amazing! Especially with the tequila! They are so good, Stephanie! The sweet potatoes just soak up the flavors, and then with the crunch of onion and freshness of cilantro, I could eat a million of them! You'll be glad you did, Ricki! If you don't want to use a tortilla, you could wrap some filling in a lettuce or other green leaf! 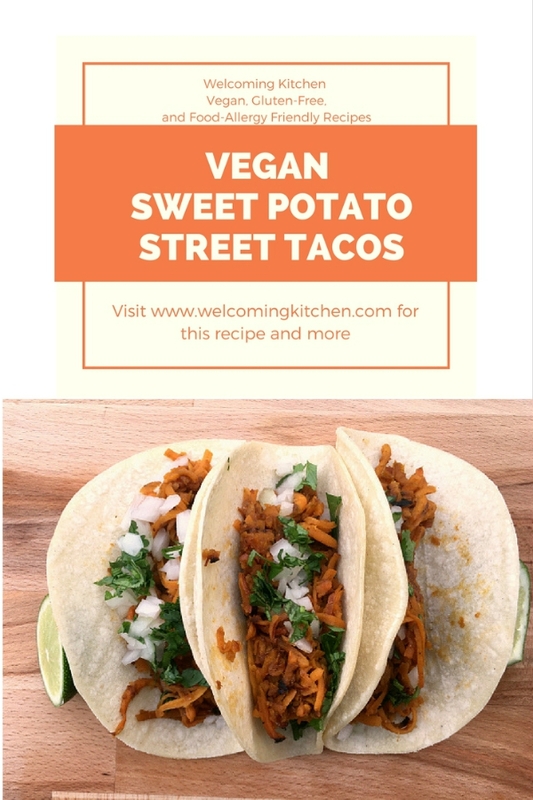 I have to admit, I'm not a an of the jackfruit tacos that are popular, but these sweet potato tacos look right up my alley! The adobo with it sounds like the perfect flavor combo. 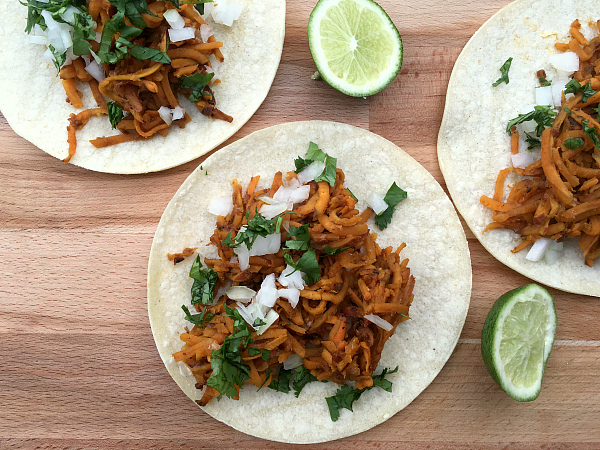 I really prefer the texture of the sweet potato in these tacos to jackfruit tacos, Alisa. I think you'll really like them! We just had these for dinner -- oh my, so good! Sweet and spicy, and the whole downstairs smelled amazing while they were cooking. We had them with guacamole, and I think they would also be good with black beans. This recipe is a keeper, thank you! Thank you, Kim. I really love them, too! I'm so glad you liked them, too.